When I went to Brazil in 2006, I flew into Sao Paulo and stayed a day with friends, then took off to Maceio, my first stop on that great adventure. Maceio is a city of around 600,000 people on the Northeast Coast, the capital of Alagoas state, and has some of the most beautiful beaches in the world. These cabanas are a common site along the beach in Maceio. 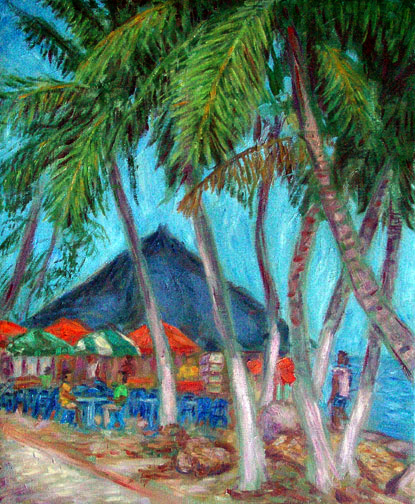 I love the bright colors of the umbrellas and chairs on the outdoor patio, and palm grove next to the beach. PaulB's Pointillistic/Impressionist original oil paintings of Brazil and various prints and poster formats of a wide variety of subject matter by the Pointillistic/Impressionist oil painter from landscape/waterscape paintings, dance, sports, portrait, to classical figures, flowers, rock and roll, Maceio, and Brazil paintings and prints are available for purchase for as little as $24.95 for an 8" x 10" matted print on photo pape. Pointillistic/Impressionist Giclee prints of Brazil on real canvas or heavy watercolor paper are available. One of a kind Maceio, Brazil embellished prints, which are Giclee prints retouched in genuine oil paint by PaulB. Unless noted PaulB's original Pointillistic/Impressionist oil paintiings are oil on canvas. Paul Berenson's pointillistic/Impressionist oil paintings are in privale collections around the world, including the downtown Los Angeles Athletic Club and have appeared in numerous publications, including the New York Philharmonic Playbill. PaulB.com also builds websites and PaulB is a member of the LA Web Professionals Group.